Teaching Authors--6 Children's Authors Who Also Teach Writing: New Picture Book Giveaway! I HATCHED! Every spring and summer, the edges of our gravel road are alive with killdeer. When I take my morning walk, they zigzag ahead of me or zip down the narrow strip between tire tracks and roadside weeds. Those are adults, of course, trying to distract me, hoping I’ll chase them rather than stop and look for their eggs/chicks. Their nests shouldn’t be too difficult to spot, as the females lay their eggs atop a shallow pile of sticks or stones. Not that I’ve found one yet. But one of these days I’ll be in the right place at the right time. A few years ago, I read about the birds online. I wasn’t thinking of writing a book; I just wanted to know more about them. And oh, my. The chicks were ADORABLE. They’re precocial, staying in the shell longer than most “yard” birds. When they break out, they’re ready to go, miniature versions of their parents, running and searching for bugs and exploring their world. Not long after reading about them, I had a vivid, just-before-waking dream. In it, a killdeer chick hatched and, in a funny little birdie voice, narrated aloud as he ran around discovering his neighborhood and himself. I woke, drowsy, and as I stretched I thought: Ohhh, that was a sweet dream…WAIT A MINUTE! …because I’d just realized that the birdie’s voice was in rhyme. Yowser. I stumbled to my office to jot down any lines I could remember – only two, but thankfully I recalled the gist and was able to reconstruct the rest over the next few days. “A baby chick bursts from his egg and into the world with hilarious enthusiasm, awe, and I-can't-help-myself energy, capturing babies' delight in new discovery and parents' joy in this amazing new person. Rompy, rhyming text evokes the zeal of a toddler who's eager for everything. And Jen Corace's gorgeous artwork is alive with critters and curiosities and surprises--the biggest of which? The hatching of a new baby sister, to the absolute delight of her now 'expert' big brother! You can win an autographed copy of I HATCHED! by entering with Rafflecopter, below. The contest will end January 31st. Please add a note in our comments section telling us why you hope to win the book. Thanks! P.S. If you see an early version of this post, there won't be pictures, as Blogger isn't letting me post them, for some reason. I'll keep trying! If you're reading a later version, and you see the pics just fine and dandy, then, um, never mind. I had the pleasure of watching these babies one early morning breakfast while visiting relatives in Missouri. They were delightful as you described. Congratulations on the new book-looks wonderful! This sounds like a WONDERFUL book, Jill. I can't wait to see it! Congratulations. Such a sweet book. I remember you sharing it with me at the fall conference. I love the back story!! 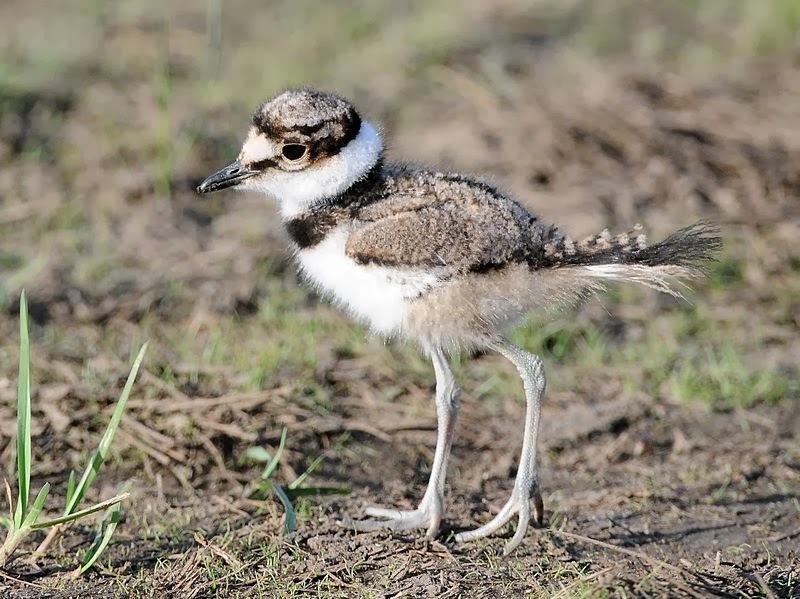 I saw a young killdeer once along Elwood Dr. in Ames. It was trapped on the pavement and couldn't get up over the curb to safety. Because I lead with my heart not my head I stopped busy traffic in order to help the bird off the street. I believe I could see the relief in its mother's eyes. I've been attracted to those birds for years. I'd love to see this book! Andrea: Oh, I'm so glad you took the time. They're just such precious little things, aren't they? Why do I hope to win a copy of this book? That's easy. I love Jill Esbaum's writing to the point of envy. Masterful rhymes and clever humor. Plus, I grew up in Minnesota and saw killdeer everywhere! But I never ever saw a chick. So fun to read the story behind Jill's story. Now I'm even more anxious for spring to come so I can go killdeer watching! I want to win a copy to add to our collection at the Burlington Public Library. Our collection budget has been reduced to ZERO and new books are a luxury. We'd love to have this book in the Amity Public Library in Oregon. Yet another terrific Jill Esbaum Original Picture Book! Congrats on I HATCHED! 's arrival! And, thanks for introducing me to a little bird I'd never met. Love watching killdeer. They are such unique birds, but I've never seen a baby one. Congrats on the book. Looks adorable! Congratulations, Jill! 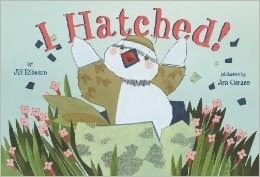 I hope to win a copy of "I Hatched!" so I can study it as a mentor text. And I might, just might share it with my kids. And of course, I would review it on my blog for Perfect Picture Book Friday. Thanks for running the contest. At one time we lived in the country, our driveway, long and gravel. Every spring the Killdeer built a nest and hatch their young. We now live in the city, oh how I miss the killdeer. I can't wait to read your book! A rhyming dream becomes a book? How fantastic! Love the cover, and Jill's books are always sublime. Congratulations! What a wonderful concept for a picture book. I love watching Killdeer - all birdies actually they are so keen and beautiful! And I am anxious to read this book! I find killdeer to be so interesting to watch too. Love the back story to this book! It would be great to show teachers and students how to be inspired to write. Esther & Margaret: Thank you! Ramona & Kristen: Good luck with your own writing! Ann: Thanks. Another of my upcoming picture books prominently features birdies, too. Love 'em! Elsie: I'm all for inspiring students to write. Hope it works! Oops. "wish" it would happen again. This sounds and looks like a lovely book. The cover is so appealing! I'd love to have a copy for my collection! Jill, What a great way to write a story. You are such an inspiration! I always love hearing the backstory of how a book came to be. Thank you for sharing that. It sounds adorable, and I know my 3 yrs. old granddaughter would love it! Iza: I know! Jen did such a beautiful job of capturing his exuberance. Linda: I hope she does! Great inspiration! And perseverance over 3 years to publishing! I love the sound of this book. Can't wait to read it. I have found a nest or two, and have seen the wee ones running around after leaving. Congratulations on your book! Cindy, lucky you. And thanks! I'm looking forward to reading your book! I love the little things in nature, birds, and rhyme. I'd like to write more of it, too. So I'd enjoy reading your book for myself as well as to my grandkids :) Thanks for sharing your background story! I enjoyed reading your post about meeting the National Geographic editor at the buffet dinner just now. That got me here AND I am eager to check out your nonfiction books. Great advice for those of us who are slow starters. Thanks for reading, skanny17. Hope you like the books! Quick explanation! I tried to comment etc. from my Droid phone and it would just not work for the survey either. It kept looping back and putting up the comment so that is what the deleted comments is all about! Congratulations on your new book! Hatched sounds like a winner. We've got killdeer living near us, and watching the mom do its broken wing routine is a blast. What a wonderful title. I'm excited to see the chicks and their actions. I loved birds since my Girl Scout badge. I can't get my blogger page to work. I will post it on Facebook. And THANKS so much, Deborah. I appreciate it! Reading these comments, I can't wait to see HATCHED--and to grab some children, snuggle up, and enjoy! Thanks, Marie. Hope they like it! This looks fabulous, Jill! Can't wait to read it! We once had a killdeer make her nest in driveway, BTW. A ring of stones, with four speckled eggs in the center. Unfortunately, despite marking the nest with traffic cones, the eggs met their untimely end under the wheels of a UPS truck. :( The killdeer does seem to have a neat personality to feature in a kid's book, though. Looking forward to reading your book! Liana: Oh, no! And after taking such care. I'd think neighborhood cats might find a nest that conspicuous hard to resist, too. I'm so glad there's now what promises to be a wonderful book about these little guys. Their effervescence is remarkable. Looking forward to reading it and giving a copy to the mother of a little friend of mine whose ready-for-anything attitude reminds me of those chicks.